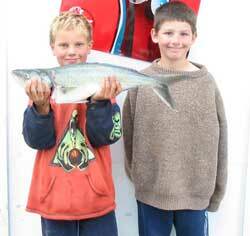 We went fishing while camping at Tauranga Bay Holiday Park in Northland leading up to New Years. After setting up we spoke to the other campers. They were catching snapper between 2-3kg but it had been a bit slow over the last week. So we looked over the chart in the camp store to see if we could pick potential hot spots as well as taking into account the areas where the oyster and cray farms are. Once the baits were prepared we were off for an evening fish in our kayaks, just on dusk with an incoming tide on the week leading up to a new moon. I had one set in 50 foot of water producing some nice snapper around 3kg. My mate Dave got some around 3-4.5kg as well as telling me how he got snapped off 7 times. The next morning we laid the longline using two Floating Bead Traces then five normal Target Hook traces repeated like this over the entire bottom line. At first I did not feel any real tugs until I started pulling in the line, I was overjoyed as we had several snapper all in excess of 5kg. We headed back to the camp after two sets with 12 fish including one barracuda which was to be cut up for bait. Above : Pauls son Peter struggling under the weight of the two biggest snapper of the set. The next morning was rather comical as we noticed our boatie campers coming out so we evaded them by ducking into one of the many caves to give them the slip as we did not want our spot to get hammered by the whole camp. Once again we returned to camp around 7am loaded down with our limit in two kayaks. Our smallest snapper weighed 3.5kg and the heaviest was over 9kg. The next day I took my son out in a kayak and he was thrilled to have been towed upstream by some nice snapper. We lost one on retrieval that was a good 12kg but we were happy to return to camp with two snapper over 9kg and some paua measuring up to 225mm. On our last day I got over to the spot we were fishing in the past week and asked our neighbours from the camp, Glenny & Roy if they had had any bites. The reply was a definite no. I was so confident I said "don't worry guys I'll get some for you." I lay my longline just past them and I loaded up with good fish. I pulled up four snapper from 8kg to 9kg on one set from under their boat. After two sets I had to put my fish in their boat as my kayak was about to sink due to the sheer weight. When you cannot fit three snapper in a large chilly bin you know they are a good size. The only way to go fishing is with the right gear and as I am a kayak fisherman I use only the best - a Paul's Fishing Kites Boat Longline modified for use off my kayak as well as the incredible Target Hooks. I also purchased some of Paul's new Floating Bead Traces and found these to be the best thing ever when setting close into foul as you are more than doubling your chances of hooking into big fish. 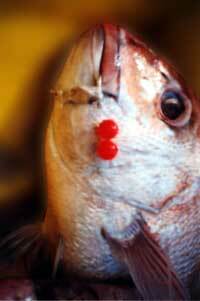 All my snapper over 5kg were taken on these hooks. After reading about Kevin Griffiths and how he goes kite fishing in a wheelchair I was really keen to give it a go myself. 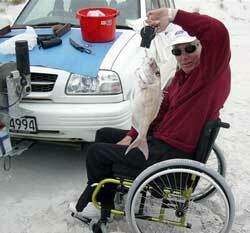 I couldn't believe it could be so easy to go fishing let alone kitefishing in a wheelchair. I called him up and we made arrangements to go to the Far North and meet up with him and Emma. I went to the Far North between the 8th and 15th of December. 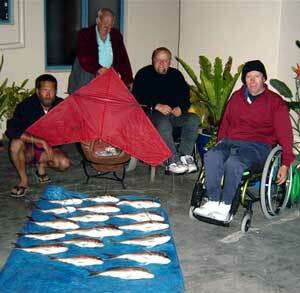 Right : Some of our catch from our last trip out kitefishing. Our last fish was a night fish somewhere on the east coast north of Kaitaia (Kev Griffiths has all the directions and photos) one set each for three kites and 17 snapper total. We had five days out fishing around the area and totalled 32 good sized snapper, half a dozen kahawai plus other species. A superb time for me!! Left : My first look at a snapper. The weather has improved over the last week with a good westerly wind, flat sea and a good moon. The fishing is improving with moki coming in as reported last week. There has been reports of some good gurnard caught off the beach. Haden Baley came down to the beach on Monday and put out his Super Kite powered Bottom Longline. He caught seven gurnard. The heaviest weighed 1.48kg. Jim Edwards and his family from Dannevirke put out one set and brought in three gurnard, heaviest was 1.32kg. Jacob Hughes from Hastings caught three gurnard and his heaviest weighed 1.34kg. There was a fishing competition here over Wellington Anniversary weekend, run by the local fishing club. This attracted a few surfcasters and according to the reports I heard, only one kahawai was landed. 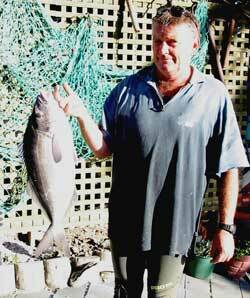 Right : Tony Mulvaney with his 3.8kg blue moki taken from the southern end of the bay on Tuesday evening. The heaviest gurnard was caught from a boat and weighed just over 1kg. It was necessary to go 25 mile off the coast to ensure a good catch. This is even more reason to stay on the beach and put a kite rig out. 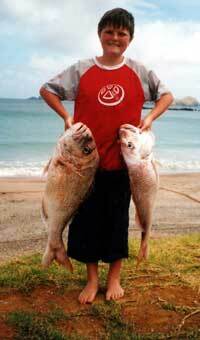 Left : Dean Phillips with their 2.56kg kahawai caught on a spinner down at the mouth of the River on Monday. Toheroas are being washed up on the beach lately. This should attract the snapper to come in close. A huge toheroa found beach cast on Porangahau Beach. Michael Crafar's daughter with a 1.38kg gurnard caught last evening, on a new Pau'ls Super Kite powered Bottom Longline Rig. It was their first day out yesterday with their rig and the first set in the morning came in with two kahawai. Michael came into our shop at lunch time to ask where the gurnard were so I told him and away he went. They came back last evening, on their first set targeting gurnard they caught seven gurnard. On the second set they caught five gurnard with the heaviest at 1.38kg. An excellent day on the beach. I finally had a wind that would let me send out my Flexiwing Kite. I headed down to Midway Beach, East Cape. There was a moderate westerly blowing when I arrived at the beach, perfect. On the first set, using trevally and squid for bait, six hooks returned a very large gurnard, two pan sized snapper and a shark. I returned the shark to the water and reset using a mixture of squid and bonito for bait. 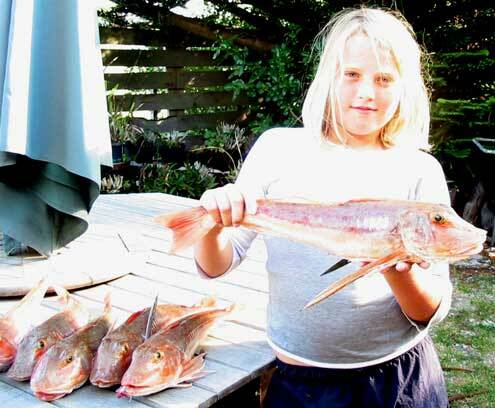 From eleven hooks I caught a couple of small snapper, three kahawai and another very large gurnard. We had more than we could eat and anyone who knows me knows that I can eat a lot, so we tidied up & headed for home. I did notice a couple of other fishermen putting out longlines to about 300m or so, but not quite as rewarding. David Barnes went fishing out off Martins Bay on Monday night. There were two of them fishing from a small boat and they decided to have a go at putting out their Boat Longline. They caught five good sized snapper plus a most unusual catch on two of the hooks. One hook came in with an unidentified part of a fish (possibly the lips? ), and another hook came in with a complete eyeball from an unfortunate fish. Obviously it was looking too long at the bait. Between the two fishermen they caught over 40 fish during the night including those on the longline. They brought 15 home and released the rest. Interestingly all the fish were caught between midnight and daybreak on Tuesday. David reports there was a huge run of fish around 5am. Only one fish was gut hooked out of all the fish caught, which is good news. David puts this down to using the Target Snapper Hooks. One boat left Martins Bay around 6am and came back to the ramp by 9am, with no fish. This time of year is a great time to be fishing early in the morning or into the evening. Fishing in bright, sunny conditions and clear water is generally not that productive as the fish become very shy at feeding. This rule usually applies in water less than 100 feet deep, unless you are fishing at the Mokohinaus or other deep water fishery.